Not to be confused with Britannia metal. Britannia silver is an alloy of silver containing 11 ounces and 10 pennyweight (i.e. 11.5 troy ounces) silver in the pound troy, i.e. 23/24ths, or 95.83%, by weight silver, the balance being usually copper. This standard was introduced in England by Act of Parliament in 1697 to replace sterling silver (92.5% silver) as the obligatory standard for items of "wrought plate". The lion passant gardant hallmark denoting sterling was replaced with "the figure of a woman commonly called Britannia", and the leopard's head mark of the Worshipful Company of Goldsmiths replaced with a "lion's head erased". Britannia standard silver was introduced as part of the great recoinage scheme of William III from 1696, when attempts were made to limit the clipping and melting of sterling silver coinage. A higher standard for wrought plate meant that sterling silver coins could not easily be used as a source of raw material because additional fine silver, which was in short supply at the time, would have to be added to bring the purity of the alloy up to the higher standard. 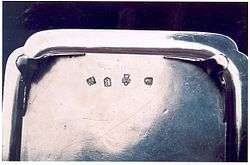 Britannia silver is considerably softer than sterling, and after complaints from the trade, sterling silver was again authorised for use by silversmiths from 1 June 1720, and thereafter Britannia silver has remained an optional standard for hallmarking in the United Kingdom and Ireland. Since the hallmarking changes of 1 January 1999, Britannia silver has been denoted by the millesimal fineness hallmark 958, with the symbol of Britannia being applied optionally. The silver bullion coins of the Royal Mint issued since 1997, known as "Britannias" for their reverse image, were minted in Britannia standard silver until 2012. Britannia silver should be distinguished from Britannia metal, a pewter-like alloy containing no silver. Forbes, John (1999). Hallmark: A History of the London Assay Office. London: Unicorn Press Ltd. ISBN 9780906290262. This article is issued from Wikipedia - version of the 10/7/2016. The text is available under the Creative Commons Attribution/Share Alike but additional terms may apply for the media files.